Hi all! This is a special Fun Finds, not just because it's BLACK FRIDAY. It's special because we're featuring the Etsy shop of a friend of ours. A very VERY generous friend who has sent boxes and boxes of great toys to Allie's Alma Mater, Wayside Waifs. Dozens of shelter kitties in the past 2 years have benefited from Suki's mom's generosity, and we believe in paying it forward. and the cats love them. One of the things I love about these toys is that they are responsibly made with absolutely no plastic parts that a kitty could accidentally swallow and choke on. 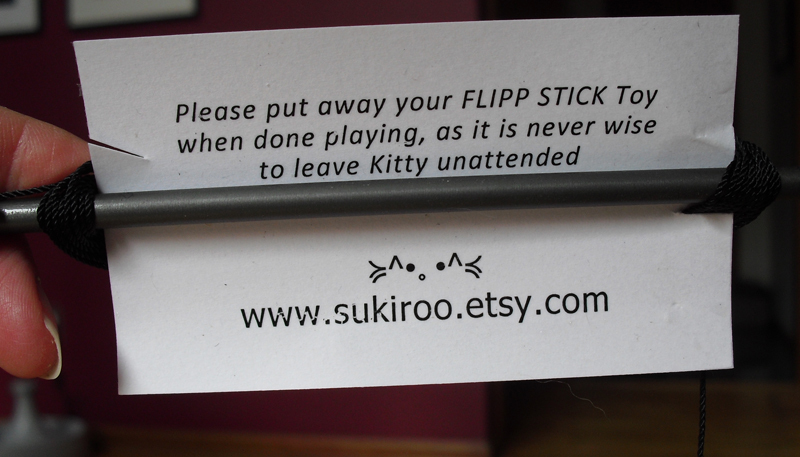 I also like the fact that the flipp stick comes with a friendly warning to put it out of the reach of paws when you're not playing with it. Even great wand and stick/string toys can become hazards if left out. They really can. Faraday once grabbed a wand toy by the feathered top and ran full tilt across the room with the stick part pushed in front of him. He could have impaled himself on that thing. After our hearts stopped and we got it away from him, we put all wand toys away, to be used only under human supervision. Faraday was thrilled to be offered the Flipper Shortie...until Maxwell snatched it right from under his nose. we highly recommend SukiRoo's Etsy shop. 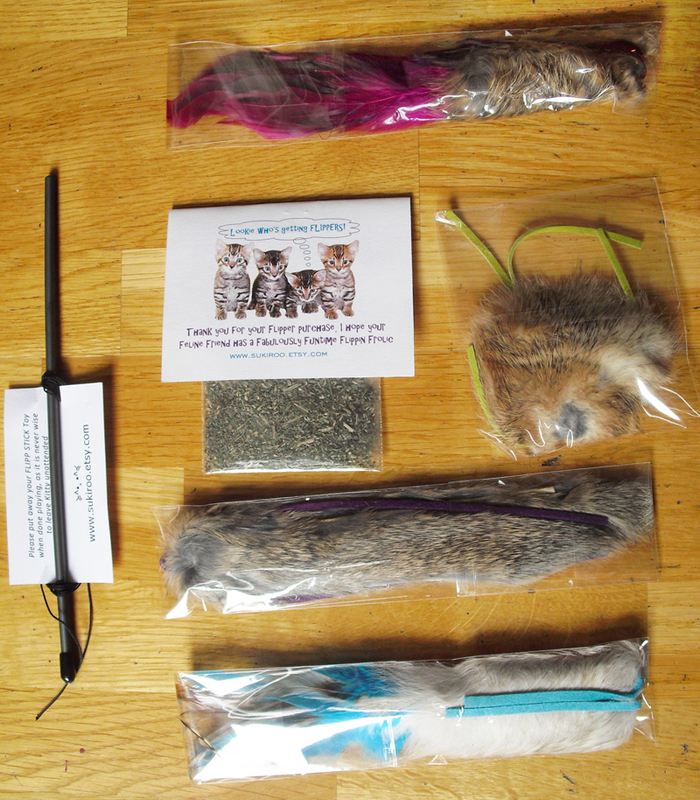 FTC Disclaimer: We were sent a donation of cat toys by SukiRoo for the Wayside Waifs shelter, but were not compensated in any way personally for this review. We were not asked to do this review by Sukiroo. All opinions are our own. Have a fabulous Friday and have lots of fun with the new toys. MOL, I'm betting any DNA test will come back with multiple donors! 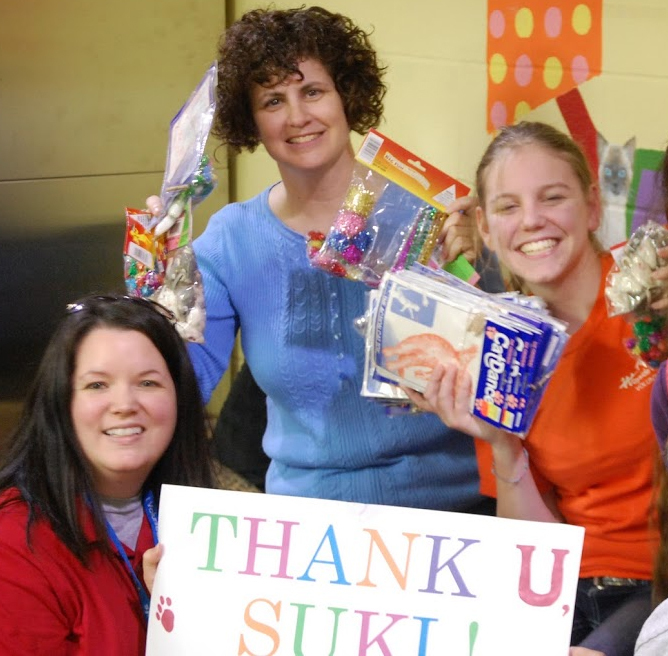 Great post about Suki's generosity and paying it forward ... Love the pics! I am sure the kitties at the shelter appreciate the toys! 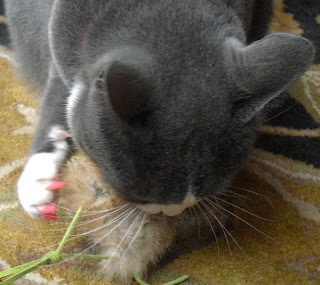 It never ceases to amaze me how toys made specifically for cats can be so dangerous!! It looks like your friend's shop might do very well!! Those toys look like lots of fun! We're gonna check them out!! Those toys look pawsome! TW has to get me some. Whoa! Amy gets famous with you guys. My mom buy toy´s that almost look like that from lady here in Sweden and I LOVE LOVE LOVE to play with them !